SUMMARY: Climate scientist Paul Beckwith from the University of Ottawa rejoins Alex Smith to investigate the latest record heat, melting, and emissions. Are we already entering an extreme climate shift? * even more ice loss in Antarctica then we knew. Listen to or download this Radio Ecoshock show in CD Quality or Lo-Fi. From Pole to Pole, and around the world, climate news is streaming in, and it’s not good. We are crashing into the age of global warming. Here to help us is one of our favorite guests, scientist Paul Beckwith. Paul has two Masters degrees, and is currently working on his PHD in climate science at the University of Ottawa in Canada. That turned out to be too true. Hardly had we hung up the phone last Friday, that news poured in about more than a dozen killed by extreme flooding in Oklahoma and Texas. Eleven inches of rain fell in the Houston area in 24 hours. Even concrete bridges were knocked out of the way by the raging flood waters. May have? The United Nations IPCC and many other climate scientists released papers on the advent of extreme weather now that the climate system is breaking down. Extreme rainfall events have been happening around the world. We know the role that increased water vapor in a hotter world plays, and we know the heated oceans play a part too. It’s not a secret. Maybe it’s still a secret in Texas and Oklahoma, who keep voting in climate deniers to Congress, like Senator James Inhofe. I have to wonder what it will take to get the average American to wake up and stop voting for people who stop action to save us from even worse climatic events. Also on the weekend, the supreme heat wave hitting India. It’s especially bad in the Southern Indian states, where temperatures hit 48 degrees, and then flirted with 50 degrees C in some places (188-120 degrees Fahrenheit). More than a thousand died. In our interview, Paul Beckwith tells us why babies and seniors tend to die first. The Indian government advised people to stay inside. Let me tell you, I’ve been to India, and to Southern India. Millions of people must work every day, or begin the process of starvation for their families. Or course they are going to work in the heat. They must. And many die. Air-conditioning? Don’t forget at least 200 million people in India don’t have any access to electricity. People in developing countries die because of our carbon-rich lifestyles. It makes me angry. Anyway, let’s go through just some of the top climate stories, as we move around the globe, starting with two very disturbing records. First this. “CO2 averaged 404.11 parts per million the week beginning May 3, a new weekly record. My comment: It’s no big surprise. This whole civilization is based on transferring fossil fuels from underground into gases in the sky. That’s what we do…expect to read this story every year. “The first quarter of 2015, a transcendental for the fight against climate change year, has set a new world record high temperatures in the recent history of the Earth. Data from the National Atmospheric Administration (NOAA) indicate that in March recorded the highest temperature for this time of year since 136 years ago were initiated record, surpassing the previous record, 2010, at 0.05 ° C.
The first quarter of 2015 was the warmest period of history in the middle of the land and ocean surfaces in the world, at 0.82 ° C above the average of the twentieth century, surpassing the previous record-from 2002 to 0, 05 ° C.
The average land surface temperature was also overall record for the January-March period. Most of Europe, Asia, South America, East Africa and western North America have had an onset of warmer than normal year, according to the official news agency of the United States. Get another take on this story here. Maybe every year won’t break the records, but most will. Let’s go to the regional view, starting with this story out of Russia. “A DEVASTATING and sudden acceleration of climate change which is currently being sparked could result in ‘awful consequences’, a leading scientist has warned. “Climate change expert Professor Sergey Kirpotin, [in Tomsk] 51 said this could result in ‘awful’ consequences. ‘Bogs are extremely important for humanity. They function as a sort of natural freezer as they don’t let the carbon build up in the atmosphere,’ he told The Siberian Times. ‘However, the permafrost in northern areas of western Siberia has started melting. As the permafrost thaws, it creates new lakes and old ones get bigger. “All the organics trapped in permafrost start decomposing rather quickly. “Obviously, a lot of greenhouse gases, such as carbon dioxide and methane, are released into the atmosphere. Many stations in Spain’s Valencian community went above their June records, and were near their all-time records for any month. The record set at Valencia Airport today was 6.6 °C (11.9 °F) above the previous highest May temperature, was 4.4 °C (7.9 °F) higher than the record for June, and was the 3rd hottest temperature since records began in 1869 for any month! The last big El Nino we experienced caused new records in heat, during the winter of 1997/98. That was the year Indonesian peat fires turned that country into one of the world’s biggest sources of greenhouse gas emissions. The smoke covered most of southeast Asia. What will burn down this time? RELATED: CARBON EMISSIONS INCREASE RISK OF U.S. MEGADROUGHTS. California drought continues despite weak El Nino conditions. NASA says on our current carbon course, the whole US Southwest will experience a drought like the 1930’s dustbowl, but lasting for 30 or 35 years – a whole generation. That will happen this century they say. “Carbon emissions could dramatically increase risk of U.S. megadroughts” says NASA. This from the Arctic News blog. Our guest Paul Beckwith explains it takes 80 calories (a measure of heat energy) to melt 1 gram of ice. When the ice is gone, it takes just 1 calorie to raise the temperature of water 1 degree. Theoretically, the same 80 calories of heat falling on ocean instead of ice could raise the surface temperature by 80 degrees! (It doesn’t because there is mixing with cooler water below – but this shows the huge difference between having ice in the Arctic and not. I’ll bet the cost is far higher, if you include loss of forests, the costs of fighting fires, the toll on farm animals and crops, etc. The key insight to this article is that extreme heat doesn’t just affect outside workers. Even people who work in air-conditioned offices lose productivity. Why? Because humans don’t sleep as well during hot nights. When heat waves hit in summer, do you have trouble sleeping? And the next day, even though you are working in air-conditioning, are you a bit slower, your judgement a bit off, or your patience a bit frayed? In a paper published today in Nature Climate Change, we and colleagues show that heat stress probably cost the Australian economy nearly A$7 billion in 2013-2014 through productivity losses such as those we’ve mentioned above. That bodes ill for the future, with heatwaves forecast to get hotter and more common thanks to climate change. While we should continue to attempt to mitigate climate change, we need to take steps to adapt. Find the original paper in Nature here, as published online May 4th. Here on Radio Ecoshock, we like to follow the truth, whether it is convenient to theories or not. So far, the greater number of deaths are still caused by cold. But that ratio will change, says Paul Beckwith, as the coldest parts of Earth appear to be warming much faster than the global average. Just look at Alaska this past winter. It was often warmer there than in New England. We’ve just heard from Jonathan Mingle the same is true in the Himalayas, often called the world’ Third Pole. And I’ve reported on news that Antarctica is melting more rapidly that we thought (more on that below). Extreme weather gets more attention, but moderately cold weather is most deadly by far, a study says, analyzing deaths in 13 countries. In the U.S., 84% of days are colder than the ‘optimum,’ least-deadly temperature. Extreme heat waves like the one that killed more than 70,000 Europeans in 2003 may be the most visible examples of deadly weather, but cold days actually cause more deaths than hot ones, a new study says. After examining more than 74 million deaths that occurred in 13 countries from 1985 to 2012, researchers calculated that 7.3% of them could be attributed to cold weather and 0.4% to hot weather. In another counterintuitive finding, extreme weather — either hot or cold — was responsible for only 11% of the weather-related deaths, according to the study published Thursday in the journal Lancet. ‘Heat stroke on hot days and hypothermia on cold days only account for small proportions of excess deaths,’ the international research team wrote. The researchers collected daily data on weather conditions, air pollution and deaths from 384 cities around the world. For each city, they calculated the temperature at which deaths were least likely to occur. All other days were compared to days with this ‘optimum’ temperature. With the bulk of the days in all areas being below the ideal temperature, days rated cold but not extremely cold were blamed for the most deaths — 6.7% during the study period. Extreme cold was responsible for about 10% of all deaths on cold days. However, extreme heat was responsible for about half of all deaths on hot days. Paul and I discuss the paradox of US President Barack Obama saying that climate change is an extreme threat to the nation’s security – and then approving drilling in the Arctic by Shell! What the world does not need is more fossil fuels, especially in the fragile Arctic ecosystem. Shell has their giant platform in the Seattle harbor. 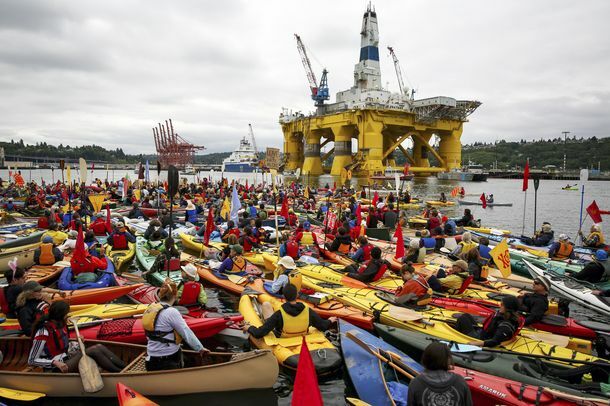 Scads of Kayakers turned out to surround the rig in protest. Shell says their drilling is perfectly safe, even though (a) their last attempt ended in a dangerous failure when their rig broke down and had to be towed back and (b) there is no reliable secondary drilling rig to try to stop a blowout, like the BP giant spill in the Gulf of Mexico. And remember that the Arctic also lacks the warm-water bacteria the helped eat up some of the BP oil. What spills in the Arctic stays in the Arctic, possibly for thousands of years. Paul wonders if Obama isn’t picking his battles carefully. Perhaps it will take one spill or breakdown in the Arctic to bring the public call for banning all drilling. One allowed might stop thousands of planned rigs invading the Arctic in search of more fossil fuels we cannot afford to burn. A few weeks ago I tried to wrap up all the Antarctic news with Dr. Roland C. Warner, the Tasmanian scientist. As I said at the beginning of this post, new and bad climate news just never ends. NASA now announces they’ve discovered another ice shelf that passed a tipping point of no return in 2009. We’re just finding out about that one. The troubling news continues this week for the Antarctic peninsula region, which juts out from the icy continent. Last week, scientists documented threats to the Larsen C and the remainder of the Larsen B ice shelf (most of which collapsed in 2002). The remnant of Larsen B, NASA researchers said, may not last past 2020. And as for Larsen C, the Scotland-sized ice shelf could also be at potentially ‘imminent risk’ due to a rift across its mass that is growing in size (though it appears more stable than the remainder of Larsen B). And the staccato of May melt news isn’t over, it seems. Thursday in Science, researchers from the University of Bristol in Britain, along with researchers from Germany, France and the Netherlands, reported on the retreat of a suite of glaciers farther south from Larsen B and C along the Bellingshausen Sea, in a region known as the Southern Antarctic Peninsula. Chris Mooney does great work on climate reporting. Here is another verion of that same story. Multiple large glaciers that were previously not thought to be in danger of melting have been crumbling since 2009, according to a new study published in Science. Researchers have discovered that glaciers on the southern Antarctic Peninsula’s coastline have been steadily thinning over the past several years, with some dwindling by as much as 13 feet per year. The glaciers had not shrunk significantly before 2009. So Antarctica is into “unstoppable” melting. Greenland is pouring ice water into the sea at terrific rates. How far is sea level really going to rise? I recall a few months ago Paul Beckwith put out a You tube video asking if it’s possible the world might experience 7 meters (!!) of sea level rise by 2070. That’s 22 feet. At the time I really didn’t get it. In this interview, Paul explains his methods and reasoning, and now I wonder if he isn’t right. We know for sure that scientists who take a linear view are kidding themselves and everyone else. If we say there is 3 centimeters of sea level rise now, and then extend that to the rest of the century, it looks like a meter of sea level rise by 2100. That’s what the IPCC has said. But once you find out that melting is doubling every few years, that’s all nonsense. We’ll get a lot more than that! Check out how Paul explains it, in this interview. Or watch Paul’s explanation in this You tube video. As I’ve said before on Radio Ecoshock, if I want to get a quote or explanation of climate research by Canadian government scientists, I have to submit my questions in advance. That request is sent to the Office of the Prime Minister, where junior know-nothings will tell the scientist what to say – a few weeks after the news has passed. Now Prime Minister Stephen Harper has taken his religious fundamentalism, and his love for the Tar Sands, much further. It’s not just climate scientists who are muzzled, but all sorts of people, including biologists and more. Research paid for by the Canadian tax payer is hidden away, made secret. It’s something Stalin would do. In the past two weeks there have been multiple demonstrations by government scientists and workers demanding the right of free speech. It’s easy. Just as the American scientists do (after the bravery of Dr. James Hansen) – the scientist merely has to say they are speaking for themselves, and not the Canadian government. It’s been sad to see scientists in their lab coats out with signs, demanding basic human rights. Shame on the government of Stephen Harper. This is an election year. A big change is needed, because Canada has joined the likes of Saudi Arabia in trying to tear down and weaken any effort to forestall the worst of climate change. Until recently, Canada did not even have a plan to reduce emissions. We love the Tar Sands! Who cares if people in India die of heat, if Texans are flooded out, if Canadian forests are ravaged by out-of-control insects. Money drives Canada. Throughout this whole interview, we get more than snapshots of a planet in trouble. Paul gives us a lot of the reasons behind things, explanations of the way the Earth systems really work. It’s an education – and that’s no surprise because Paul gives lectures at the University of Ottawa. He’s a teacher, a communicator, and a research. It’s a rare mix. Paul has two Masters degrees, and is working on his PHD in climate science. He’s tasked himself with the specific project of investigating whether a rapid shift in our climate is possible, what would drive that, and what are the signs. We had record heat here on Canada’s West Coast last week. We’re getting the hottest of summer weather in the Middle of May. Is this it? Given all we’ve talked about, could we be going into a shift in the global climate regime, the one Paul has been researching? Follow Paul Beckwith on his Facebook page here. Here are some links to just a few of Paul Beckwith’s You tube videos. Abrupt climate system change is underway. Global food shocks from climate disruption. I’ve given you a lot of bad news this week. Next week, we’ll talk about what we need to do about it. Next week we’ll talk about the Climate Pledge – a call for a mass mobilization and a change as great as America’s sudden shift in 1942, to fight the Axis powers. The President told the car makers to stop making cars. Everyone, from housemakers to farmers were called to support the war effort. Over 40% of U.S. produce was grown locally, in Victory Gardens. Now that President Barack Obama has admitted climate disruption is a much greater threat than terrorism, it’s way past time to act. button on this page, or get more options here. This program continues only by support from listeners. Following all the news in recent weeks, are we already entering a climate shift? How would we know? Those are questions I asked myself, in my newest song, called “Show Me”. This piece was written with female vocals courtesy of Mike Greene of realitone.com, and Tantra, from Dmitri Sches. You can also download this song from Soundcloud, or easily make a link to pass this music on to others. As always, thank you for listening, and caring about your world. ← Mobilize to Save the Climate! Strange, the most immportant subject about our future by the scientist who is putting it all together and no comments. The paid deniers must not have found this site. Thank you for your work Paul.